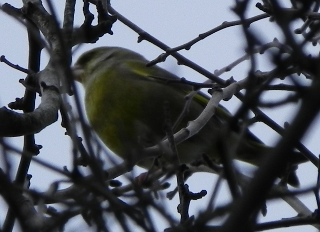 In the hedge opposite the stables there are sometimes a pair (at least) of greenfinches. The part of the hedge they like best is covered with ivy – it’s probably the ivy berries they go there for. But it does make them very hard to see – small green birds in amongst green ivy leaves that are about the size of a small green bird. When the sun shines on them (the sun does shine here – although today you wouldn’t believe it – I blame the sun spots, myself) they glitter in the top of the hedge like tiny parrots. I understand that they’ve not been very well lately – the population peaked in about 1990 but since 2005 they’ve been hit by some sort of bug that makes it difficult for them to feed. Our lot look and sound healthy enough at the moment so I’m keeping my fingers crossed for them.